Version 2.0 - UPDATED NARROWER DESIGN! 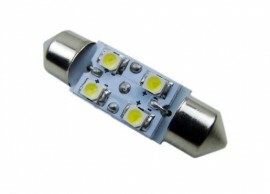 Click Here to check if your car uses 6418 / 36mm size bulbs for the License Plate! Pop out one stock bulb at a time. Install one LED bulb at a time to make sure the polarity is correct. Nice white color, relatively easy to install and no error codes. Thanks! I purchased these LED bulbs for my 2010 Jetta TDi Cup. Spent quite some time trying to find a set and heard nothing but great things about TunerDomes and their products.